After receiving his bachelor's degree from Duke University and studying Mandarin at Nanjing University, Louis-Vincent joined the French Army where he served as a second lieutenant in a mountain infantry battalion. After a couple of years, Louis-Vincent left the army and joined Paribas Capital Markets where he worked as a financial analyst first in Paris, then in Hong Kong. Louis-Vincent left Paribas in 1999 to launch GaveKal Research with Charles Gave and Anatole Kaletsky in London. In 2002, Louis-Vincent left the London office and returned to Hong Kong; the idea at the time was that Asia was set to become an ever more important factor in global growth and that, consequently, GaveKal needed to offer its clients more information, and more ideas, relating to Asia. Louis-Vincent contributes frequently to the research and was the main author of our books "Our Brave New World" and "The End is Not Nigh". Louis-Vincent is CEO of Gavekal and Marshall Wace GaveKal. Thank you Louis for speaking with us today. Before we begin can you tell us a little about your background and your firm. I am a founding partner of an independent research and asset management firm named Gavekal, which is now 12 years old. We have eight partners and are headquartered in HK, with about 50 people on staff, over 2/3 in HK and the rest in Beijing, Denver and London. Our research is macro-oriented with a strong Asia slant and on China in particular. Our clients are primarily institutional, about 75% in Europe and the US. Most are looking to keep abreast of events in the region. The other half our business is money management and today we have US$700+ million under management in Pan-Asian, Japan, China and Global Equities funds. There is real concern whether an economic recovery in the US can be sustained given excessive reliance on government stimulus, consumer deleveraging and cash-rich corporations who are unwilling to invest and step up their hiring plans. At the same time you remain optimistic. What causes this positive sentiment? While US Q2 GDP numbers were a disappointment on the surface - painting a negative picture of a slowing economy when you go into detail the numbers were actually quite positive. Goods and services rose 4.1%. This is the highest increase on record since the downturn began in 2008. The surprise is that demand is filled by foreign rather than domestic goods. That means the trade deficit is accelerating. So the US consumer is not falling apart, but is buying foreign goods. This speaks to the high competitiveness of Asian manufacturers. You can say that is what got us into this mess in the first place and what we have to hope for is that US exports pick up. I think they will as Asia is entering a new more inward-oriented phase where it will focus on optimizing infrastructure, boosting consumption and living standards, and other improvements that play to America's strengths in technology, branding, entertainment and other services. The consensus right now is global demand will prove insufficient. And it could be because I am in Asia but I don't see that at all. Here growth has been quite strong. One other option is the US is going through a major transition that is not accurately reflected in the statistics. People are not buying cars yet they are lining up around the block to buy iPads. So while US data is good at measuring car sales, it is not as effective measuring iPad's and the value-chain for these kinds of products. These are goods that are largely produced in Southern China, but most of the mark-up goes directly to Apple. As a result it is extremely cash-rich and is well positioned moving forward. Can demand in Emerging Asia and other BRIC economies replace consumption in the US, Europe and Japan? If so, over what time frame? This is what is happening right now. If you look at 2009 what happened? This was the first ever economic recovery led by China. That is a meaningful change and has never happened before. Until then, all recoveries were led by the US consumer. This was led by Chinese stimulus, infrastructure spending, and higher consumption. And over the last twelve months China has been one of the worst performing markets. It is down 30% -- yet what is interesting is if you break down performance you see high levels of diversity. Those relating to consumption, including beverages, pharmaceuticals and consumer staples are all doing well, while infrastructure, major exporters and the financials are falling. If you look across Asia the best performing stocks are the airlines. For example Asiana in Korea and Thai Air in Thailand. That tells us something as airline stocks generally lag the market and oil prices have gone up over that time. This is an indicator that consumption is rising and geared to future growth. While it is true these sectors and markets have cycles, the reality is these stocks keep making higher lows and the spread in performance between Asian and Western consumption stocks keeps widening. Exports remain important though not so much in terms of adding to GDP growth, but rather in terms of allowing Asia to enhance its competitiveness. So for example a company like Motorola opens a plant in Shanghai and brings in know-how and capacity. The local companies then have to step up their capabilities or get wiped out. That is why exports are important. Not because they add a percent or two to GDP. The bottom line is that economic growth is the result of three factors: positive demographics, labor productivity and capital productivity. That is how you get growth. Demographics will be fine in Asia for the next 5 years, beyond which we may see some problems develop. Labor and capital productivity are going through the roof thanks in part to transfers of knowledge and expertise from the west. That will continue for awhile, as these regions catch up and gain a global GDP share in accordance with their potential and the size of their populations. We often hear about the need to restrain government and allow the "free market" to guide economic activity yet China -- which has extensive government involvement -- has been a star performer for more than a decade. How has government in China been able to maintain growth and do you think it will be sustained going forward? If we see a slowdown in China, how will this affect the world at large? I think it is the trend that is important. In China the government has been scaling back and getting out of the way of entrepreneurs. The tragedy of Asia has been that Japan is a profoundly socialist country on which capitalism was imposed while China has been the reverse. But slowly but surely, this is changing and China is returning to its true capitalist nature. This is a progressive, non-linear, process. But as the government gets out of the way sector-by-sector China's share of global GDP rises. It has gone from 5 to 12%. In my view I don't think 20% should be a problem -- as that is China's share of global population. Japan had been a leader of growth in Asia but has now endured over two decades of anemic economic performance. At the same time while there are serious structural issues the ¥en remains one of the world's strongest currencies. How do you explain this phenomenon and how do you see its prospects? I think if we simply stay with the idea that growth is the result of demographics, labor productivity gains and capital productivity gains, then the answer for Japan's tame growth performance is easy enough to understand. Indeed, as everyone knows, the demographic picture has been deteriorating rapidly. Meanwhile, it is challenging to get strong labor productivity gains out of an ageing population (the old saying of not teaching an old dog new tricks...). Which means that, to get strong growth, Japan, given its ageing demographic profile, Japan would need to register out of the ordinary capital productivity gains. Now I actually believe that this could be possible though NOT in an environment in which government spending keeps on increasing. Indeed, the problem with government is that it is the one sector of the economy that knows no 'creative destruction', thus, as that sector grows into a bigger component of the overall economy, capital productivity is bound to fall. Now turning to your question on the Yen, this is a tough one though the first thing I would say is that there is a low correlation between economic growth rates and exchange rates at the best of time. 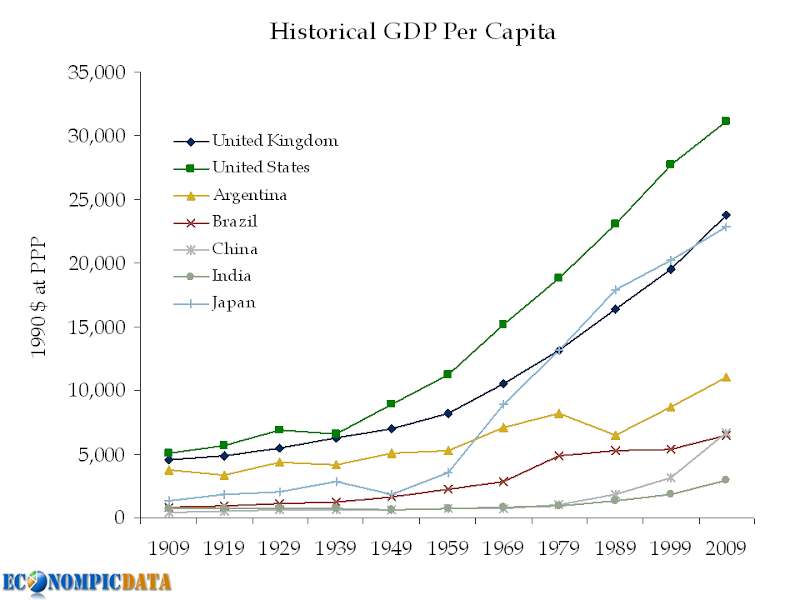 After all, in the past decade, the four weakest growth economies in the western world have been Italy, Germany, Switzerland and Japan and these have had the strongest currencies while countries like Sweden, and more obviously China or Korea, have registered very solid growth rates with unimpressive curreny gains. I think that, at any one time, the exchange markets can be driven by many different forces. One of these forces may be economic growth, or interest rate differentials, or risk aversion/willingness, or trade balances, or ease of financing etc... In short, it is very dangerous to solely look at a country's economic performance and draw wider conclusions for the FX market. Additionally, how do you view Korea as an investment? We are very bullish on Korean equities, on bonds and on the Won and have been increasing our exposure in our pan-Asian fund to all three. The Korean equity market is trading at 9x earnings, while the Won is one standard deviation (at least) undervalued on a purchasing parity against all three majors (Euro, Yen, US$). A lot of your work focuses on Asia yet your work goes far beyond many analysts whose model focuses on "higher growth rates + more favorable demographics = ever-stronger commodity prices". Is there a reason you are more focused on technology and other industries? I am not sure higher growth always translates into higher commodity prices. In the West we saw strong growth from the 1940-90s but commodity prices went down. Commodities have 40 year cycles where marginal prices keep falling and investment declines. This leads to declines in capacity and with the long lead times needed to rectify these imbalances there is rapid appreciation and ten year bull markets. These are then followed by declines after capacity is reached. In the past ten years we have witnessed amazing increases in Chinese infrastructure pending. China did in 10 years what US did in 100. They built roads, canals, and now high-speed rails, so obviously that was good for commodities. But by 2014 most of this will be done. While there may still be great reasons to be invested in commodities China's consumption is likely to decline. It could be India will take over and that is the hope of many, but I don't think they can do it at the same pace. It will take them 30 years to do what China did in 10. That is because they have more of a civil society and as a democracy with a slow-acting legal system they have less ability to mobilize. So we will have to see if this is a typical ten-year commodity boom cycle or it is the super cycle people are hoping for. It is hard, however, to find new copper. I personally don't buy the peak oil theory but possibly peak copper. There is also lots of investment right now going into coal and iron ore.
Gold for me is just another way to play China and India. Many people in these countries are getting rich and they don't have a lot of tools to build an efficient portfolio. They can buy real estate, but likely already have some. They can also buy local stocks but that is a casino, so there is little else you can do with this new wealth. This is especially true if you made money that you do not wish to declare to the tax authorities. So gold is a good investment as you can hide it. For me it has an uptrend until they liberalize controls and their capital account. I think then it will be the same as in France in 1982. They liberalized and people sold their gold to take advantage of other options. So gold is likely to do well until the day China or India gets rid of capital controls. Then it is likely to decline. Recently we have begun to see more clients interested in Southeast Asia. Some of this is due to a desire for diversification and to prevent an overreliance on China, though there is also recognition of its resource endowment, competitive cost structure, rising living standards and scale should the promise of ASEAN be realized. What is your view on Southeast Asia and its potential? I am very optimistic on Southeast Asia. All three of the growth prerequisites I mentioned earlier - positive demographics and labor and capital productivity are on an upward trajectory in Southeast Asia. They also have lots of resources. This has not gone unnoticed by the major powers. The US and China are looking for friends and so far China seems to be doing a better job though the US is now starting to pay more attention. Japan also has been active in Southeast Asia though more on the corporate level, as Japanese firms buy companies and assets in the region. One indicator of how investors regard the region is the perfomance of Southeast Asian government bonds. These have been remarkably stable even with problems in Greece and Southern Europe. They have been exhibiting Madoff-like charts, which show little to no volatility. I think China is the buyer. Right now we are also starting to see a power play going on in Southeast Asia, not only in terms of developing economic alliances, but on the security side. China is moving to assert its power over the Spratly Islands and in one demonstration of their rising influence, the Philippines Foreign Minister came out ten days ago and said this issue is between the Philippines and China and the US. Ironically today Vietnam is one of the main allies of the US in the region though the US is also developing a better relationship with the Indonesian military. In any case we are now seeing a major reorganization of relationships and alliances in Southeast Asia as well as rising economic performance, so greater attention is justified from corporate and portfolio investors. The US has seen it manufacturing capacity decimated as production has moved offshore and we have placed a greater emphasis on distribution and services. At the same time the US dollar has gotten progressively weaker. While there is still a wide divergence in costs, we are starting to see prices and wages rise in Asia. Does this point to renewed potential for US manufacturing and exports of services? Have costs adjusted to the point where US firms may be more competitive than they realize? Yes. I think there are opportunities for the US and firms like Proctor & Gamble and McDonalds as well as WalMart and others who can build super stores are all here and should do well. For an auto-parts maker in Detroit it will be tougher and what they have to do is keep producing better and smarter than competitors in China. But those manufacturers who have survived Japanese, Korean and Chinese competition should be up to the challenge. If I am not mistaken in the US, manufacturing is at about 12% or so of GDP, and it seems unlikely it will go much lower. The US has already made its move to a service economy. So what are the largest exports today? It is in areas such as education and entertainment. So frankly if I were sitting in the US right now what I would be most worried about is if my kids want to get into a good college they now need to be smarter not only than Johnny down the street, but the 5 million or Chinese kids his own age who are also now the competition. The West's competitiveness is going to be in steel and shoe exporting, but rather in healthcare, entertainment, finance, education, etc. and other areas where the US still has a competitive advantage. So I wouldn't despair of the US just yet as you have a presence of the industries of the future. At the same time the US should produce more engineers, however comparisons with China are somewhat simplistic as engineers in China do not have the same training and qualifications, so the definition is not the same. Additionally, as has been the case for 20 years or so, the US has been able to make up any deficiency by importing them. You have that amazing ability to do that by immigration and by their second generation the kids will be American. No other country has that same ability. Investing has become far more difficult during this time of high volatility where one can find gains achieved over long periods of time wiped out in minutes after a bad piece of news is received. Buy and hold is far more problematic and we have even seen famed money managers such as Stanley Druckenmiller retire given the difficulties of maintaining performance. How does one operate in this kind of environment? This means investment decisions have to be fairly simple. In our view we believe in the trend toward higher Asian currencies, lower Asian real interest rates and a boom in Asian consumption. There are many ways to play that. This includes US exporters, Asian local currency bonds and Asian consumption stocks, many of which are low caps. So if you know and accept there will be volatility you wait for pullbacks and when there are spikes upward you lighten. That is the strategy we have been following in our own funds. One of the main questions facing investors is whether we are facing more of an inflationary or deflationary environment. Where do you stand on this question? It depends on what part of the world you are sitting in. In Asia we could very well wind up with inflation. Central banks here have historically followed the US Federal Reserve in their policies. While we have seen some tightening if they continue to do that we could wind up with a serious inflation problem. In the US, however, the banks are on their flat on their back so it is hard to see how inflation will happen there. But I don't see a 15-year Japanese style phenomenon. I think there will be reasonably decent growth and slow inflation while in Asia we have more to worry about. Only two months ago we were talking of the Euro reaching parity with the US$ and today we are seeing this fear dissipate. Will we see a period of European outperformance? I think what is happening in Europe is clear. Southern Europe has major problems but Northern Europe has restructured and is in good shape. So the media likes a good story but if you combine Scandinavia and Switzerland, which are booming they are marginally bigger than the Southern European PIGS, which are in trouble but you have a boom in the North to factor against it. That does not take into consideration good performance in Germany, which is Europe's largest exporter and we think this outperformance will continue. Thank you Louis for taking time to speak with us. Before we conclude any final words to leave with our readers? Thank you very much for giving me this platform to share some thoughts. I think the question that investors have to confront today is whether we are seeing a rebalancing of global growth, or not. Indeed, in 2009, we saw the first cycle in which the recovery was led by China rather than the US. Was this a fluke? Or the new economic reality? The answer to that simple question is bound to drive your asset allocation for years to come. Keith W. Rabin serves as President at KWR International, Inc., a consulting firm specializing in the delivery of Asia-focused trade, business and investment development, research and public relations/public affairs services for corporate and government clients. For more information, please visit http://www.kwrintl.com.